Preheat the oven to 400 degrees F. Pierce the potatoes in a few places with a fork and microwave until almost tender, about 10 minutes, turning halfway through. Let cool slightly, then peel and cut into 1/2-inch dice. Heat the butter in a large cast-iron skillet over medium-high heat. Add the kielbasa and cook, stirring, until it starts to brown, about 3 minutes. Add the onion and caraway seeds and cook until the onion is soft, about 3 minutes. 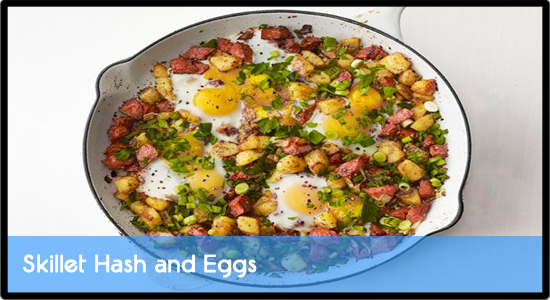 Stir in the potatoes, then flatten the hash into an even layer, pressing gently with a spatula. Cook undisturbed until crunchy and browned on the bottom, about 5 minutes. Flip the hash in sections and cook until browned on the other side, about 5 more minutes. Remove from the heat. Using a spoon, make 4 shallow indentations in the hash and crack 2 eggs into each. Transfer to the oven and bake until the egg whites set, about 10 minutes. Season with salt and pepper and top with the parsley and scallions.